We were in the supermarket one time when my wife bought a big plastic bag of salt. Confused, I informed her that we still have salt, and shouldn't we be getting the iodized version? Nope, she said. She was making salted eggs. Then we headed off for the eggs section. Making salted eggs is quite simple, as I learned later on. It's the waiting that... well, takes time. My wife's magic number for keeping the eggs submerged in the salty solution is 27 days. 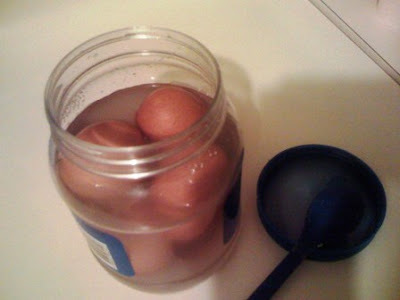 First, make sure that the jar will accommodate all the eggs. And while you're at it, fill the jar with water so you'll know just how much is needed (and add a bit more just to be sure). Boil the water on a pot. We need to supersaturate this water with salt, meaning let it accept all the salt it can dissolve until it can no longer do so. While the water is boiling, add the salt in increments (perhaps 1/4 cup at a time) and stir between intervals. When you see that the salt is no longer getting dissolved, then you have reached supersaturation point. Remove salty water from fire and let cool. The cooling process will set some of the salt to re-crystallize. Don't worry about it. 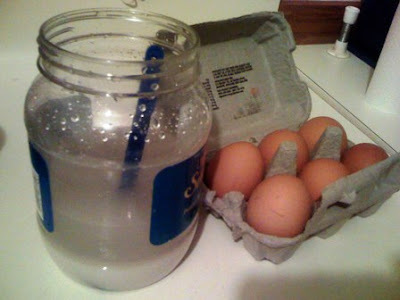 Finally, pour the cooled salty water into the jar with the eggs in it. The salty water is more dense, and the eggs will float, so make sure that all the eggs are submerged by perhaps weighing it down with clean cloth on top, or fill the jar to overflowing (as we did). With nothing else to do with the re-crystallized salt, we decided to add it on to jar also. On the 28th day, place the salty water and eggs into a pot and boil for 10 minutes on an open pot. To minimize the risk of the eggs breaking, make sure that the pot is not so big as to have the eggs rolling and bumping into each other as the water boils. Then submerge in cold water to stop the cooking process. What to do next? Make a salted egg salad! Anonymous: You're welcome! Hope you enjoy making it. Ang dali lang! Kaya lang... hindi masyado maalat yung kinalabasan. We used table salt. Mas ok kaya kung rock salt? I have written a post and I hope to have your permission to use your first pic. I will give you credit of course. :) Hoping to hear from you soon. Thanks! my: yes, feel free to use the photo. Thanks for asking permission, truly appreciated. my: I cannot access your profile and blog... do let me know para makadalaw rin ako. I like reading up on other food blogs. about "red dye". What is it? Where can I buy the red dye color? do i need to buy duck eggs or ordinary eggs is okay? Hi Marvin. Sorry I am not sure where to buy the red dye. Noel: We used ordinary eggs in this case. Super thanks. i used your recipe and my first try was a success! Perfect! Hi Nick...you gave me an idea of making salted eggs. Knowing how far for me to buy one in the Filipino store is already a hassle, because we consume 1 hour just to get to the store and of course consumption of gas. With that, I can say I can save gas and time. I will try to post in my blog about the result as well. Thanks! Whats the measurement on the salt? Hi. Just keep adding salt and mix per batch until the water could no longer dissolve it. Kailangan po b tlagang pakuluan?